Our current production time is 9-15 weeks. This is subject to change based on volume of sales. This does not include the time it takes for the package to reach you once received by UPS/USPS. Yes! Check out our Custom Bridal Bouquet page here. Yes! We offer the option to move your order ahead of other schedule to ensure the order arrives before your wedding date. Our rush fee is 20% of your total purchase. If you'd like to rush your order there is a box on the shopping cart page that can be selected to add rush processing to the order. We take extra care when packaging your order to ensure it reaches you safely including individually bubble wrapping each item. If your order is damaged during shipment please contact us within 48 hours of receiving the package with photos of the damage. We will work to file a insurance claim and will replace the damaged items. Please note that small chips in the flowers that do not take away from the overall look of the bouquet are not considered damage. Just like real flowers sola wood flowers can have small imperfections that will not take away from the look of the bouquet. Our flowers are handmade from sola wood, also known as Balsa wood. Sola flowers are lightweight and sometimes contain small brown/black pieces that are a part of the 'skin' of the flower or small imperfections such as small holes or bends. These imperfections will not take away from the overall look of the bouquet. No two flowers are alike! To preserve the life of your flowers please store them in a cool dry place. Do not keep in air tight containers or places with excessive moisture as the flowers are made from natural wood which needs to breathe. Keep out of direct sunlight for extended periods of time to preserve the color of your flowers. We ship using USPS and UPS Ground. Because of the custom nature of the product we cannot accept returns/exchanges. Once your order is placed it immediately goes into our production line. If we have not yet started on your order we will be happy to cancel it and will issue a refund in the form of a store credit. However, if your order is already being worked on by one of our designers we cannot cancel the order. 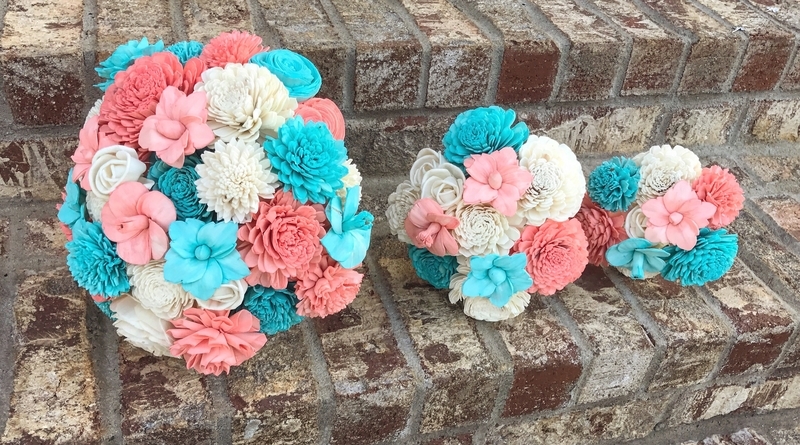 What size bouquets do you offer?